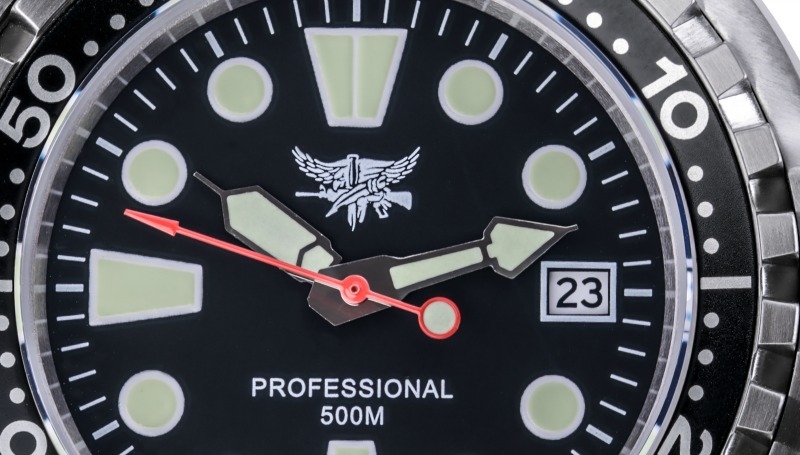 This SWAT Watch is the watch you want to own, wear, work, play and dive with because it is made by our friend and Navy EOD Tech, Dirk Assman, German Navy EOD, Command Master Chief and former Instructor at TEU-TWO. More on Dirk later. As the Exclusive Distributor for Bombfrog in the US, I get to handle the watches as they come in after clearing Customs. They are so much better than what a picture can tell. Great watch I'd wear in, on or around the water. If you're diving or just need a very robust time piece during operations, this is the watch you want to go into battle with. Anyone can take a watch and add a logo to the face of the watch but when you have the same logo engraved on the back of the watch and on the hasp, you start understanding the level of commitment to attention to detail. On top of the 3 SWAT logos, you also have a watch that is serialized. This is the first series of this watch made exclusively for SWAT. The serial numbers run from 001 to 030. We will add on starting with 031 and going forward so you know having number 007 is way more cool than having 700. 001-012 are being held in reserve for a team that wants to buy sequential serial numbers and it's the only sure way to get number 001. 013, 015-019, 023-030 are the remaining available that can be purchased. Let's review. Watch made by an absolute professional and friend to many US EOD across all branches, to exacting standards that Dirk tests himself. He QC's the watches at depth before he lets one go out the door. You won't find a better watch at this price. Dirk and I worked together at the First Sand Beach Exercise on the island of Vlieland, Holland back in 1996. Dirk has served with US EOD Forces and was stationed at TEU-TWO and probably Florida. I'll clarify that for exactness. If you've worked with Dirk, you know hard he works and how demanding he is of himself and those around him. Dirk is now the CMC for German Navy EOD R&T.